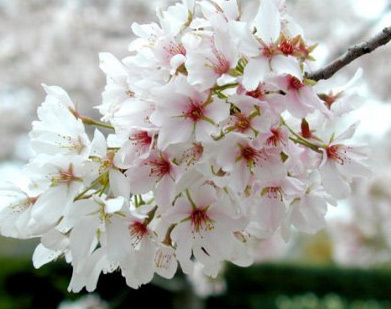 The Yoshino Cherry tree is a graceful and wide spreading tree with a strong Almond scented, notched at the tip flower, that are white with a tinge of pink that make a stunning and flamboyant appearance in March or early to mid-spring. We feel the need to clarify it could be either as the freak weather patterns we are having are moving flowering periods all over the place. 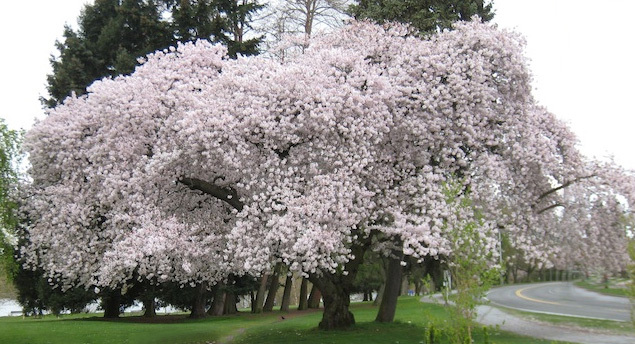 The Yoshino cherry tree is one of the most widely planted cherry trees in temperate climates worldwide. The leaves will be a pale green at first, turning to a darker green and then a rich to red purple in the Autumn. These make an excellent stand alone ornamental cherry tree because of their good looks. Probably not a good idea to use them as Avenue or road side planting trees because of their spreading habit. The fruits of the Yedoensis are very small and sweet that if stained on your clothes would be a challenge for any detergent to get out. There is more stone than flesh so not a good choice for Cherry pie manufacturers. The bark is ornamental but can be a little thin so take care when mowing or using a strimmer close by. The Yedoensis bark is marked with horizontal lines caused by lenticels which are glands that provide air exchange for the trunk. Prunus Yedoensis has moderate tolerance to drought and very little tolerance for coastal air. Keeping your Yedoensis well watered during drought will keep the tree healthy and should reduce attack from pests and diseases. 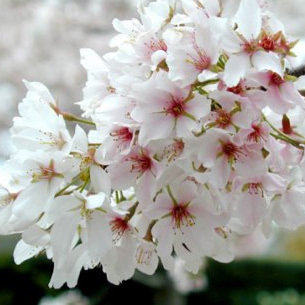 For those with a healthy interest in this tree, the Yoshino is the national flower of Japan and it is commonly found in the hilly woodlands of Japan and also on this website! The Yoshino is an easy tree to look after as it does not need pruning. You can choose to prune it to encourage new growth and therefore make it a little bushier but if you decide that BBC viewing is more compelling and a better use of your time then no harm, no foul. 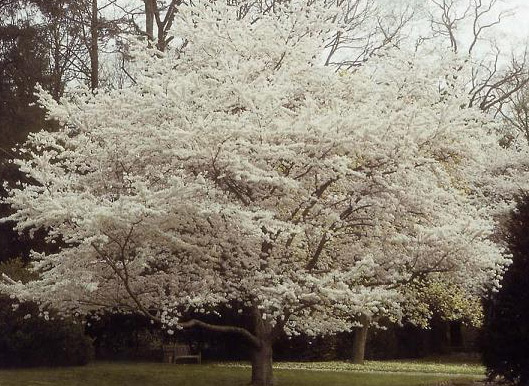 The Yoshino Cherry will tolerate chalk and clay soils however mixing the excavated soil with 50-50 well rotted compost or manure will definitely help. For those non green fingered types, not picking your dog mess up close to the tree or emptying babies potty at the base, does not count as well rotted! If you have the choice, a slightly acidic soil should provide you with enhanced results. Considered to be fully UK hardy which does not mean it tolerates overly strong tea, weak storyline soap operas and even weaker politicians but that it will survive temperatures down to minus 15 degrees centigrade. Almost enough to be a tent plant for Sir Ranulph Fiennes. We do not have anyone in the office that speaks Yoshino tree and therefore ask it directly but based on observation only, it prefers full sun and well drained soil conditions. Be aware that if part of the tree is not in full sun then that part may not develop as much as the other tree. Partial shade for a small part of the day should not affect it too much whereas an office block in your neighbours garden is probably going to stunt the growth. Expect the Yoshino to attract wild life, the flying type, not gypsy mobile home type. Our Prunus Yedoensis or Yoshino trees are supplied at a height of between 150 and 220cm tall. The actual height of the tree you receive will depend on many factors such as the previous 2 years weather, when in the year you purchased it and how careful the courier company have been. The less said about couriers the better!